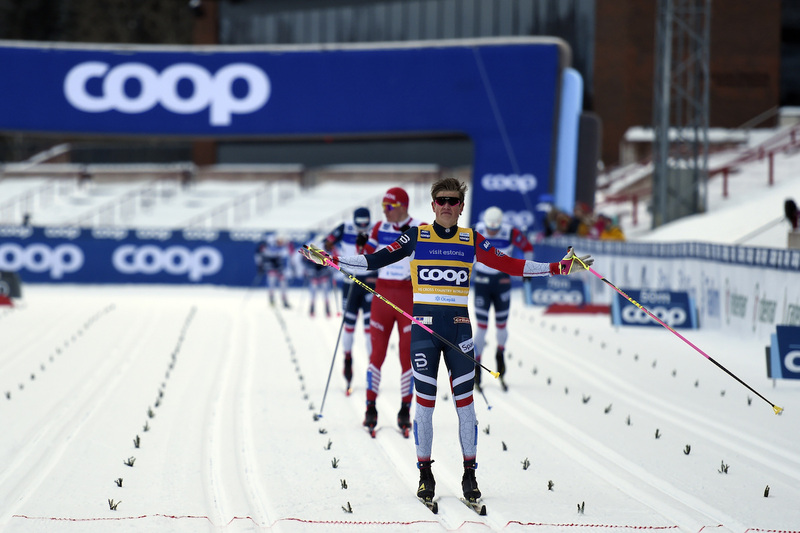 If Norway’s Johannes Høsflot Klæbo felt any nostalgia stepping out onto the men’s 1.6-kilometer classic sprint course in Otepää, Estonia–it is where he earned his first World Cup sprint victory back in 2017–it by no means slowed the 22 year old down. After winning Saturday’s qualifier in a time of 3:21.99, Klæbo went on to win both his quarter and semi. He eventually crossed the final first in a time of 3:20.05 to complete his sweep of the day’s rounds. With the win, his 18th individual World Cup victory (12th in sprint), Klæbo could be on his way to his most winningest season yet. Last winter he departed the World Cup with 10 wins total. 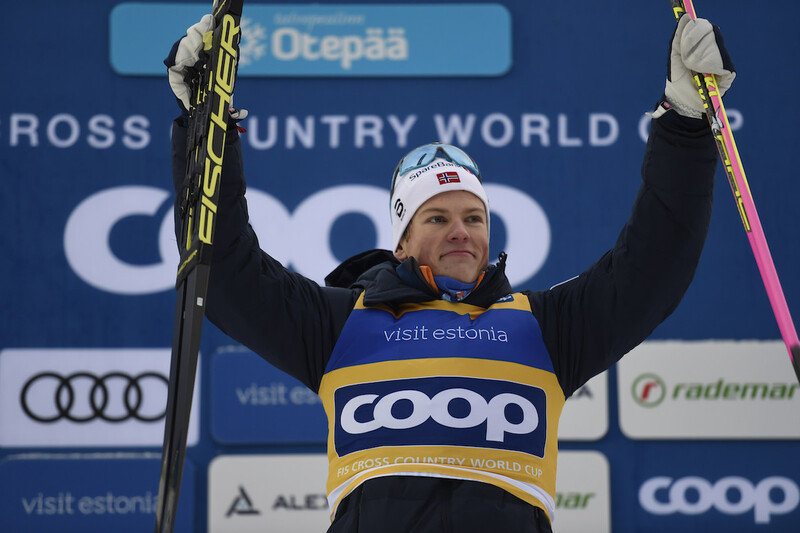 Thanks to a strong Tour de Ski and a few sprint races this year, Klæbo has already accumulated six individual victories in the 2018/2019 season. The win this Saturday came in good company, as he raced the six man final with four other Norwegians: Pål Golberg, Eirik Brandsdal, Mattis Stenshagen and Erik Valnes. Alexander Bolshunov was the lone non-Norwegian to make the final. Pitted against each other, Bolshunov appeared to be the only one in the final willing to challenge Klæbo. The two went head-to-head in the first major course climb, and by the following series of downhill S-turns, Bolshunov had positioned himself in the front. A brief double-pole section found Bolshunov and Klæbo side-by side once again, with Brandsdal and Stenshagen just behind. As the six finalists geared up for the second major climb, a steep nearly vertical pitch that forced all racers to herringbone, Klæbo maneuvered to the outside right of Bolshunov. Using a quick, herringbone clip that almost made his skis look like a fish out of water, Klæbo passed Bolshunov by the top of the ascent. After two double poles at the crest of the hill, Klæbo was tucked and descending back toward the stadium. His skis proved unmatchable by the Russian’s and by the bottom of the hill, he had put close to two meters on Bolshunov. Another meter behind Bolshunov was Golberg. With no foreseeable challenge to the win, Klæbo double poled breezily to the finishing stretch and crossed first, arms outstretched in his signature celebratory gesture. Bolshunov crossed second (+1.51) for his seventh World Cup podium of the season. 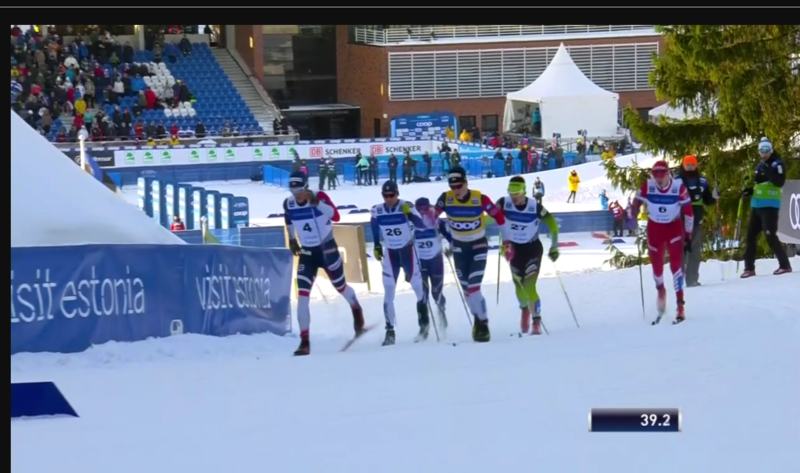 In a lunge to the line, Golberg claimed third (+2.53) over Brandsdal in fourth (+2.57). Stenshagen crossed fifth (+7.69) and Valnes sixth (+11.99). Rounding out the top ten was Norwegian Sindre Bjørnestad Skar in seventh, Sweden’s Viktor Thorn in eighth, Norway’s Sondre Turvoll Fossli in ninth and Italy’s Federico Pellegrino in tenth. The U.S. had two men qualify, with Erik Bjornsen qualifying in 23rd (+8.20) and Andy Newell 26th (+8.75). Newell went on to race the first quarterfinal with Klæbo. Avoiding a crash from Russia’s Andrey Sobakarev in the herringbone hill, Newell crossed the quarterfinal in third to end the day in 15th overall. 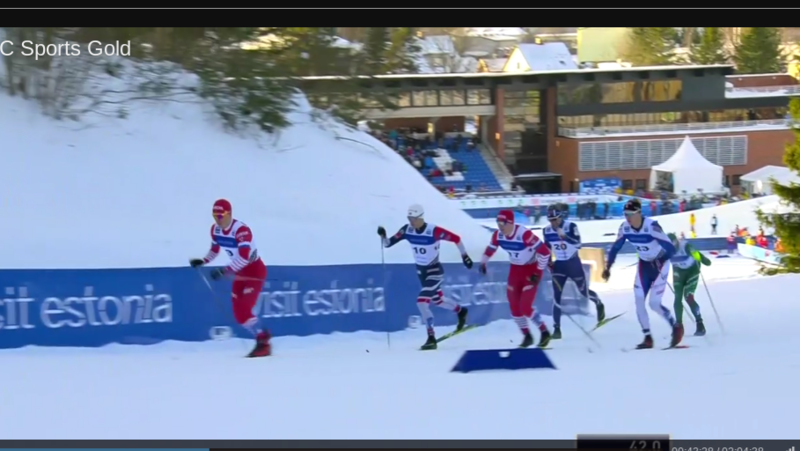 Bjornsen, who was slotted into the second quarterfinal, jockeyed for position throughout his heat, taking aggressive lines during the course’s sweeping S-turns to move from fifth to third. He dropped back once again in the herringbone hill and crossed his heat in fifth for 24th overall. Also racing for the U.S., American Kevin Bolger finished in 41st (+13.13) and Ben Saxton in 44th (+14.16). Len Valjas racing for Canada finished in 43rd (+13.61) and Bob Thompson, also for Canada, placed 51st (+15.96).